A November day and all was well with the world. I managed to pursuade Ami to come out with me to do a bit more of the Hatley Heart Attack. There was a convenient looking loop of 55 or so starting in Dunton and running south, then east through Eyeworth and over to Wrestlingworth before looping around to the north and west and back home again. The north-western section was a bit thin on the ground for us because there was a long stretch where we’d been on a previous trip, so there were long distances between caches there where we’d done every alternate one on our previous trip. It was about 14km all the way round, so about 4.5 to 5 hours of walking at normal caching velocity. We had a bit of a “moment” as we were walking down the road from Eyeworth towards Wrestlingworth, for a couple of reasons. Firstly, we had a very long gap between caches where we left two caches on the main road for a subsequent trip. It seemed ages between caches down that stretch and because it’s a surprisingly busy road and no pathways it didn’t seem particularly safe either. And secondly we got shouted at by a couple of passing motorists for walking off over a field because (according to them) we weren’t on the footpath. I have no idea how it could possibly be any of their business, and anyway, both my map and the signage on the ground clearly showed that we were on the footpath. And indeed, when we got to the other end of that stretch we could clearly see footpath signs pointing back where we’d come from too. This is one of the reasons why I have some funny views about the village of Wrestlingworth. It’s not the only reason. There are others. We also managed to completely miss one cache coming out of that village too, where the hint was something like “bottom of hedge”, and despite poking around with several sticks and checking the coordinates over and again several times we didn’t even have a sniff of it. I later found it on a different trip, but I am convinced that there had been nothing there the first time we went. 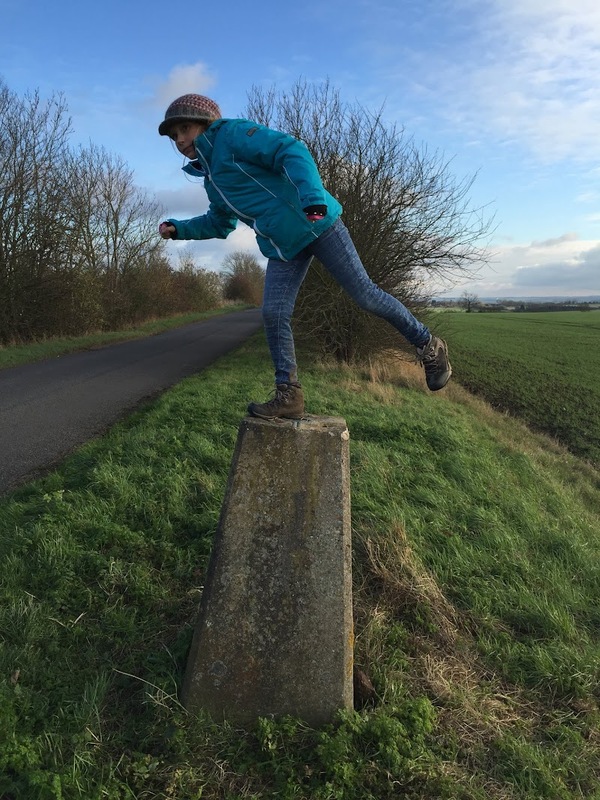 And there was a nice Trig Point for Ami to stand on top of too. Anyway, there were no major disasters, injuries or damaged equipment and we both got back to the car feeling like we’d had enough. We would have retired to the pub in Dunton for a swift half, but they were shut. 245 Hatley Heart Attack – Hello Eyeworth! 249 Hatley Heart Attack – Eyeworth Begone! 257 Hatley Heart Attack – Yes! A Pole! 260 Hatley Heart Attack – Tree? 269 Hatley Heart Attack – Dog Eggs? 271 Hatley Heart Attack – Off Gardening? 408/1 Hatley Heart Attack Link – FTF – GCZ Team!! !